NEWPORT BEACH — Sterling BMW Newport Beach has been announced as the official show sponsor of this year’s Newport Boat Show, April 19-22 at Lido Marina Village in Newport Beach. In addition to stepping aboard the latest large and midsize yachts to hit the West Coast, show-goers can check out high-flying jet pack demonstrations from JetLev and see brand-new 6 Series and 3 Series BMW automobiles at this year’s show. Like fine yachts, BMWs are known for high performance, true luxury and industry-leading design. Sterling BMW is proud to be a leading BMW dealer for Orange County and all of California — and to be this year’s official show sponsor for the Newport Boat Show. More than 200 brand-new yachts and ocean-tested brokerage boats — the West’s largest in-the-water assembly of large yachts for sale — will be presented at the 39th annual Newport Boat Show. Attendees will get a rare opportunity to step aboard, inspect and compare these unique vessels; along with seeing the latest boating gear, accessories and services. And they’ll also get a chance to see live demonstrations of the high-tech JetLev water-powered jet pack personal flight system. If you’ve been dreaming about flying a personal jet pack ever since you first watched the movie “The Rocketeer,” your wait is finally over. JetLev Technologies Inc. has introduced the JetLev R200 — a recreational jet pack that almost anyone can enjoy using over water. And you can see it in action, at the Newport Boat Show. The JetLev system is attached to a 6-foot 200 hp boat with a Sea-Doo hull. Water is pumped up to the pack through a giant tube, and the jet pack blasts water down as the passenger is propelled upward. The JetLev R200 is designed for safety, stability, ease-of-use, and precise and nearly effortless flight controls. Users can learn to fly with just a few minutes of basic training and as little as six minutes of on-water instructions. When it comes to new boats, no other event west of the Mississippi has so many to offer, exhibited in the water. New boats scheduled to appear at this year’s show include the 2012 Ocean Alexander 90 Motor Yacht, a technologically advanced and luxury-laden vessel making its Western debut. A unique skylounge sets this boat apart — with a fantastic helm, abundant seating for guests, entertainment systems, a wet bar and a day head. Aft on the boat deck is a back bar and a hot tub, along with plenty of room for a tender or personal watercraft — and it comes complete with an awning system to keep passengers cool and out of the sun. The Newport Boat Show will also showcase the first new 385 Catalina sailboat to appear on the West Coast. This new model offers exceptional sailing performance and features a large comfortable cockpit, furling sails and a bright and airy two-cabin teak interior. The diesel-powered 2013 Tiara 36 Coronet — a brand-new model from Tiara making its West Coast debut — is a great-looking boat with versatile functionality. 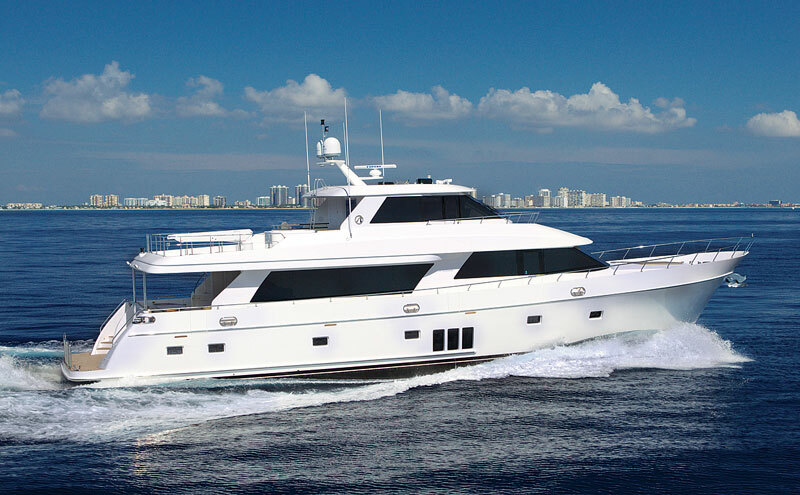 Abundant cockpit seating, a hardtop and plenty of outdoor entertainment area — plus a wet bar — makes this one of Tiara’s nicest cruising platforms ever. A centerline berth forward plus midcabin sleeping accommodations make this an ideal weekend getaway machine. The show will also feature the meticulously crafted Grand Banks 47 Heritage EU, a luxury trawler yacht that pleases the eye and offers a comfortable mix of long-range cruiser and home at sea. Twin 550 hp Cummins QSC8.3 diesel engines provide 24 knots performance. Active sport anglers will appreciate the CABO 38 Flybridge — a serious sportfisher that gets owners to the bite like no other boat its size. Its deep-V hull rides exceptionally soft in choppy head seas and is one of the driest, most comfortable fishing platforms available. The CABO 38 is powered by big twin 600 hp Cummins QSC8.3 diesels. Show-goers will see many other new boats making their West Coast debuts at the Newport Boat Show — and there will also be plenty of ocean-tested brokerage yachts that come already loaded with a full complement of navigation electronics, high-end galley appliances, entertainment systems and comfort amenities. Whether you’re looking for a new boat or the newest gear to update your current boat, the Newport Boat Show offers a rare one-stop shopping opportunity where the best products are available — at special boat show prices. Lido Marina Village — the Newport Boat Show venue — is located at Via Lido and Newport Boulevard in Newport Beach, one block south of Pacific Coast Highway. Show hours are: 10 a.m. to 7 p.m. Thursday through Saturday; 10 a.m. to 5 p.m. Sunday. Admission is $15 (credit cards accepted) for adults and free for children 12 and younger. Free offsite parking and continuous shuttle service will be available. Visit newportinwaterboatshow.com for complete details.